The Quickie Salsa M Electric Powered Wheelchair. A Salsa M will also handle uneven terrain beautifully, thanks to a patented all-wheel suspension system. 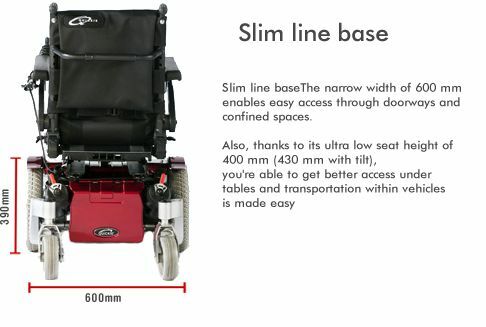 The anti-pitch design is great on sloping ground and the clever mid wheel drive means that this powerful wheelchair has no problem with a 7cm kerb. It also boasts a full range of helpful features, from flip-up foot and arm rests to a low push force in freewheel mode and an impressive 16 mile/26 km range on a full battery charge. 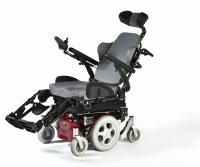 There are also a range of options for customisation: tilt-in-space, lift and tilt, recline, and powered leg rests. 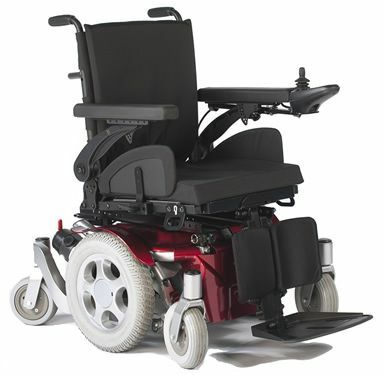 To get more information on Quickie Salsa M Wheelchairs, please phone 01642 805050 or email enq@activemobility.co.uk. An expert will get back to you and help you decide which options are best for your own personal needs. Astounding, expedient, and very easy to use; Comfortable too; I use every day without any problem and I could not do it without it! Absolutely LOVE this chair, I previously had a Invacare a Harrier chair which kept breaking down, my OT recommended the Quickie salsa M, it is so comfortable, I have the tilt and recline which helps me change position. My previous chair was so unreliable that I wouldn\'t go out on my own, but since I\'ve owned the Quickie Salsa M I\'m never home, I go out with my assistance dog and visit places that I couldn\'t take my previous chair. My new chair is very smooth, and excellent on rough, uneven ground which means I can exercise my dog in the park without fear of getting stuck. I would highly recommend this chair to everyone.